Love it or hate it? The new Chanel No.5 campaign videos starring the delectable Brad Pitt evoke a strong reaction and I’d love to know what you think. Cara Delevigne and Saskia de Brauw for Chanel Cruise. 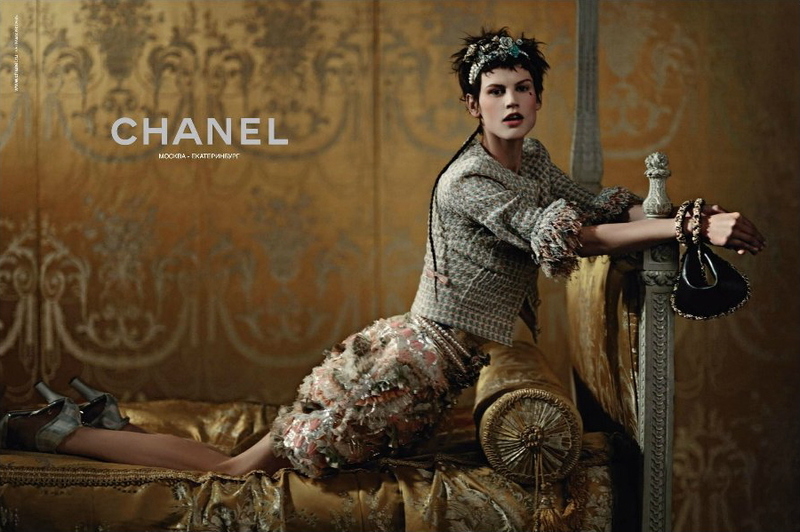 In other Chanel related news, modelling powerhouse Cara Delevigne and Saskia de Brauw star in Chanel’s sumptuous Cruise 2013 campaign, shot by Karl Lagerfeld. Victoria Beckham and Karl Lagerfeld for Elle France. Oh what’s that, you would like some more Chanel-related news? Well here you go! This week, Victoria “perfection” Beckham tweeted some behind the scenes snaps of her Elle France cover, shot on the iconic Coco Chanel stairs by Karl Lagerfeld. These are behind the scenes pics, the final cover is going to be phenomenal! Sasha Pivovarova returns to Prada. Sasha P returns to Prada after a five year hiatus for the Steven Meisel-shot Resort 2013 campaign. I love Brad and Chanel, but can't stand the ad. So pretentious, not to mention meaningless. Ooh — those Prada shoes!